Replacement brush head for Sonicare electric toothbrush, with larger surface area and contoured bristles that thoroughly cleans and massages teeth and gums. 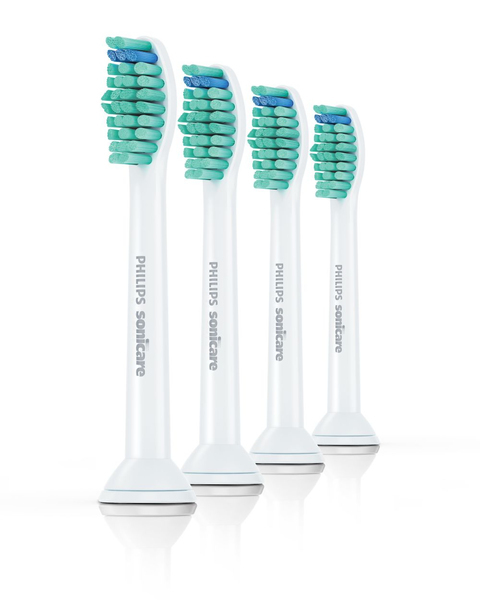 Thoughtful design and precision engineering ensure that when these Philips Sonicare replacement brushes are combined with the sonic motion and flexible brushing modes, you get a thorough clean. These Philips Sonicare electric toothbrush bristles are trimmed in a contoured pattern to fit the natural shape of teeth. The peaks and valleys along the length of the brush head are ergonomically designed to follow teeth topography and fit between teeth so you're less likely to miss places when you brush. Reminder bristles let you know when to replace the brush head. After three months of normal use bristles exhibit fatigue, and brush heads are less effective. Replace your brush head every 3 months.